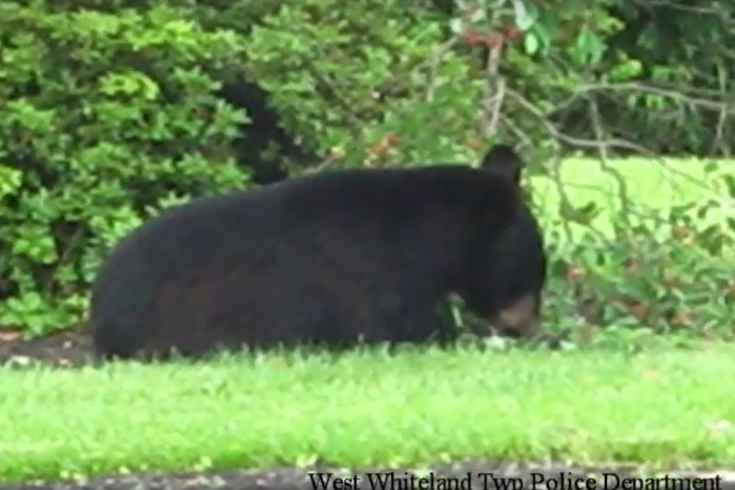 This black bear was spotted by the West Whiteland Township Police Department near the Oaklands Corporate Center in Exton on Sunday, June 5. Yet another bear has been spotted in the Greater Philadelphia Area. This time, however, there's video. The West Whiteland Township Police Department posted a recorded spotting of a black bear in Chester County on Tuesday. According to police, the video was taken outside the Oaklands Corporate Center in Exton on Sunday, June 5. Police said there have been other sightings since Sunday, and the animal is still believed to be in either Montgomery or Chester county. The Pennsylvania Game Commission is still tracking the bear, and authorities ask that if you spot the animal, not to approach or feed it, and instead go inside and call 911. There have been a number of black bear sightings in the Delaware Valley so far this spring. Earlier in May, one was seen roaming around Wissahickon Valley Park. After trying to track it down, authorities eventually suspended their search for the animal. Less than a week after that, another black bear was seen near the area of Souderton Area High School in Montgomery County. Over the course of the past month, there have been additional black bear sightings in Phoenixville, Delaware and New Jersey.